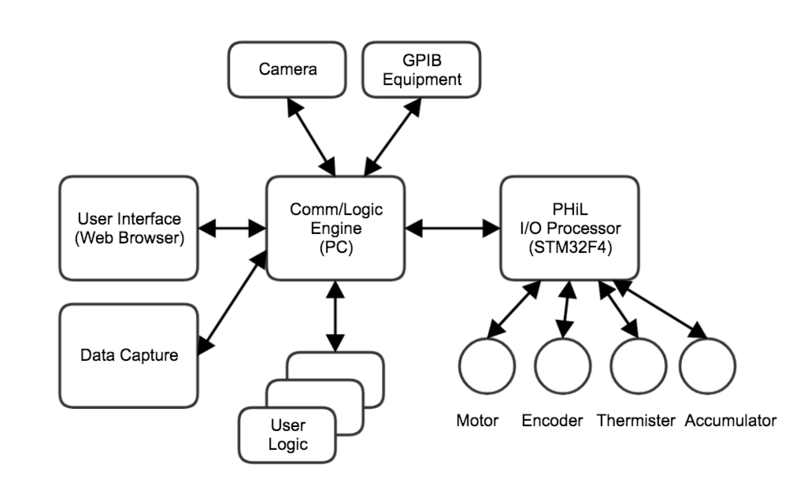 PHiL is Promenade's HiL (Hardware in the Loop) test and instrumentation tool. Low cost, yet ultra versatile, PHiL lets you drive and capture multiple digital and analog signals, either individually or coordinated. Connect 60+ designated input and output signals to your board and peripherals, and control is at your fingertips. Phil provides control and visibility from your PC. The Graphical User Interface provides quick and easy interactive displays of the running system. Connect via USB direct from the Phil board to PC. Get full visibility and accessibility into commands and properties of each pin signal. Dashboard builder with customizable widgets lets you drive or monitor signals, individually or coordinated. Coordinate pins and controls with Python scripting right in the UI. 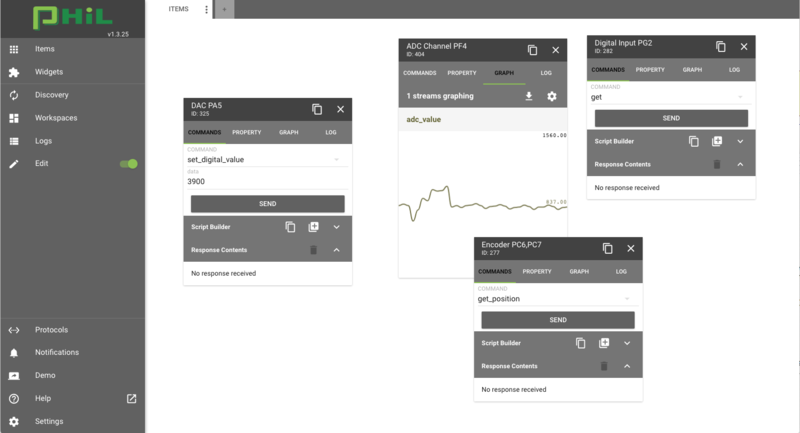 Add coordinated control of USB, GPIB, Modbus peripheral - any Python driven interface. 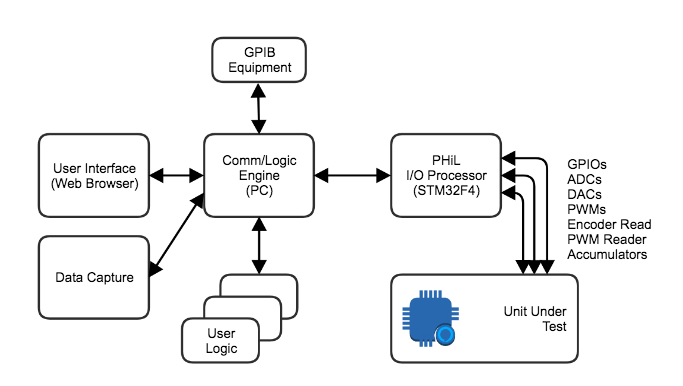 The PHiL system is a comprehensive approach employing the combination of system simulation, system stimulation, and data logging activities to explore the system behaviors. The PHiL system unleashes potential limited only by your imagination. Decide what devices to communicate with and what logic to user in acquiring data, driving components or simulating behavior. Digital IO - output from unit under test, input to PHiL. 0/3.3v. Use to read status of pins on your device or sensor. Digital IO - output from PHiL, input to unit under test. 0/3.3v. Use to drive buttons or signals to your device or sensor. 12 bit digital setting for analog output from PHiL 0-3.3v. Drive analog signals to your device. Read duty cycle and frequency input to PHiL. Monitor and chart what your board is outputting. 2 inputs to PHiL of quadrature encoder output from unit under test. Track relative position of motor over time. Manufacturer needed a test system to verify software on a small battery operated medical device with user buttons, LEDs, and DC motor. 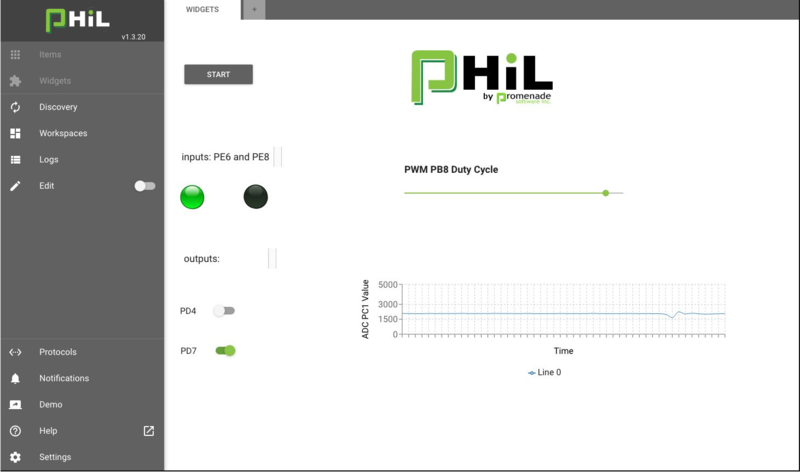 Using PHiL they are able to simulate user button presses, and chart the motor position, PWM duty cycle, and voltage over time as the device performed its tasks. Client needed to generate 4 PWM signals to test and qualify temperature control for their system. Previously limited to 1 PWM signal at a time with a signal generator, PHiL lets them output and control duty cycle for all their temperature controllers, and lets them monitor the output. With PHiL, micro-fluidic diagnostic researcher finally found solution to coordinating multiple sensors and off-the-shelf controllers under one umbrella. 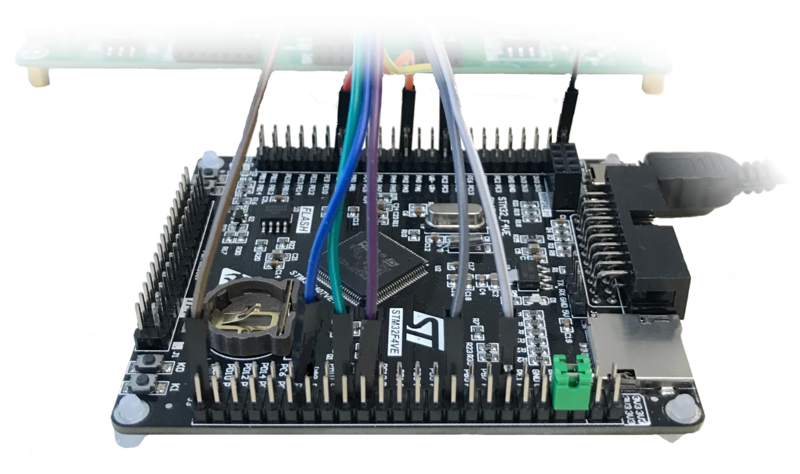 Bringing USB controlled pumps, camera, SPI ADCs, PWM outputs, and more, this clients prototype diagnostic instrument was quick and easy to assemble and modify.